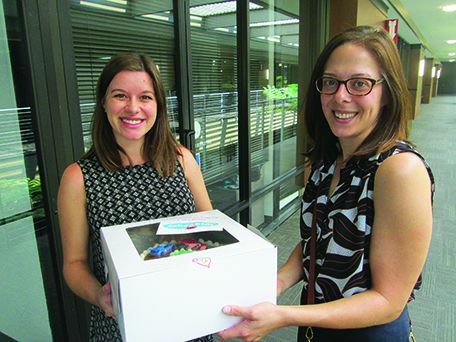 Alyssa Van Hofwegen (L) and Mary Barnes show off a delicious example of one of the cakes. SACRAMENTO REGION, CA (MPG) - A baker’s dozen is thirteen as the cake enthusiasts who attended Cake4Kids’ orientation at Arcade library on Saturday, August 18 know. 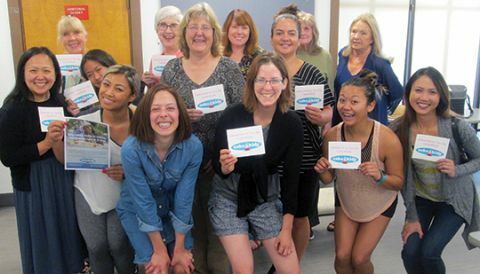 This second orientation in the Sacramento region for the Sunnyvale-based nonprofit drew bakers of all backgrounds and ages hailing from Carmichael, Arden Arcade, Rancho Cordova, Elk Grove, Rancho Murieta and beyond to learn more about Cake4Kids. Mary Barnes, Cake4Kids’ Sacramento ambassador, led the hour long program. Barnes is a Sacramento native who first discovered the group when she lived in San Francisco. When she returned to Sacramento to pursue her legal career she wanted to bring the program with her and spoke about why she chose the eastern part of Sacramento. This area, she explained, is close to freeways, homes, several nonprofits serving the demographic that Cake4Kids supports – homeless, recent immigrants, those in foster care, and victims of human trafficking – and it doesn’t cost money for parking so that left downtown and midtown out of the running. In addition to being the nonprofit’s Sacramento ambassador and tackling the job of finding volunteers, contacting agencies, and filling requests, Barnes, like other volunteers, works full time. She is also a volunteer baker and delivered the first cake in Sacramento to Opening Doors, an organization that serves individuals and families escaping human trafficking and refugees new to the area. She baked a vegan banana cake for a boy and decorated the cake with a racecar theme, complete with toy cars atop a protective layer of marzipan, and topped with vegan chocolate frosting. “We have several requests for vegan cakes from this organization. We’re challenging our bakers right away,” said Barnes, adding that all requests had been claimed and filled since the first orientation in July with twenty attendees. In 2010, Cake4Kids was born. Only thirteen cakes were baked and delivered that year. Fast forward eight years when more than 10,000 cakes have been baked and delivered by volunteers as far south as San Diego. The nonprofit also serves Fresno, Marin, Monterey, Napa, San Mateo, and five other California counties. Each cake is prepared from scratch especially for the child, decorated, packaged in a cake box, and delivered to the requesting agency. Although volunteers never meet the children, they often receive thanks from the children or, in some cases, from the parents or caregivers. Before volunteer bakers can claim cakes, they must attend a mandatory orientation where they’ll learn about the organization, the demographic served, logistics, and resources. One of the volunteer benefits is that each baker may take cake decorating classes and be reimbursed for up to $100.00 each year. The ability to be a fabulous decorator is not a requirement, although some cakes are quite lavish. Each cake, she added, must have the child’s name. During the orientation, Barnes said that 60,000 children are in foster care and only 5% between 15 and 18 years of age are adopted in California. Nearly 30 percent of children are homeless in the United States, and Barnes referenced the thousands of U.S. based human trafficking cases annually. These are some of the at-risk children Cake4Kids serves. Cake4Kids serves children and young adults up to the age of 24 and Eades said that some children as old as twenty have never had a cake before the one baked and delivered by a volunteer. She also said that the older children are extremely appreciative of the cake made just for them. Everyone should feel special one day a year. Men, women, and children 16 years and older interested in baking cakes and bringing joy to a child should sign up to be a volunteer on the organization’s website. Sacramento orientations will be held through December at Arcade and Arden-Dimick libraries. The goal is to have 100 volunteers on board. On October 20 and December 22, orientations will be held at Arcade library on Marconi from 12:30 p.m. – 1:30 p.m. On November 10, Arden-Dimick will host from 12:30 p.m. – 1:30 p.m. The September orientation date and location has not been set. For additional information, visit www.cake4kids.org.